Jerusalem is the city with a fourth dimension. If most cities are three-dimensional, then Jerusalem has an added fourth dimension, a spiritual one. A surreal place holy to Jews, Muslims and Christians and therefore significant to over one-third of all people on earth. Jerusalem is city, special in every sense of the word. Beyond its religious and historic importance, Jerusalem has developed as the capital of modern-day Israel with West Jerusalem having a modern vibrant center. Jerusalem has to be seen to be believed. Exploring Jerusalem individually works well for many, although there is a great selection of tours of Jerusalem should you wish to get even more out of your visit. The Old City of Jerusalem represents the historic and religious entities which make this city so special. Serene, surreal and intense are all words which jump to mind when describing this one-square-kilometer walled area, holy to Jews, Muslims, and Christians – perhaps the capital of world religion. The Western Wall, in the Jewish Quarter, the last remaining wall of the Jewish Temple compound, is the holiest site in Judaism, and the central focus for Jews on this city; itself is the focal point of the religion. Christ died, was buried and was resurrected in Jerusalem, and the Church of the Sepulchre in the Old City is shared between many denominations. In Islam, Jerusalem is said to be from where Muhammad rose into the heavens, and the Dome of the Rock makes this city the third holiest for Muslims. The four quarters of the Old City, Jewish, Muslim, Christian, and Armenian, each contrast with each other, yet what remains bizarrely constant is the way in which the residents of this surreal place rush about on their daily business. 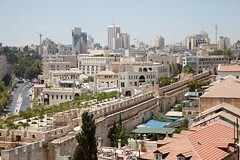 A great overview of the Old City can be had from the Ramparts Walk. The Old City of Jerusalem simply cannot be missed. The Half-Day Old City Tour or the Jerusalem Day Tour is a great way to get a fully-guided experience of this amazing place. If you’re staying in the South of the country, in Eilat, this Jerusalem, Bethlehem, and Dead Sea Day Tour from Eilat is a good option, too. Jerusalem is not all old, though. Modern, West Jerusalem is the capital of modern-day Israel containing the modern-day functions you would expect of any capital city. Although not as liberal as its younger, more relaxed sister, Tel Aviv (just 45 minutes by road), Jerusalem has become a distinguished cultural center. The wave of great cuisine which has swept across Israel has not missed the city, and there are some great restaurants in Jerusalem especially in the German Colony and along Emek Refaim Street, which is a bit of an oasis of modernity and liberalism among this conservative city.. Likewise, modern Jerusalem contains the shops and institutions you would expect anywhere else. All this, however, with a slight twist as all buildings in the city must, by law, be fronted with the magical golden Jerusalem stone the city is famous for. The modern-day center of Jerusalem is the pedestrianized area around Ben-Yehuda Street which features a large selection of restaurants, cafes, and stores. Just in the last couple of years, however, this has come under competition from Mamilla a pedestrianized mall leading right up to the Jaffa Gate of the Old City containing very upmarket shops, restaurants, and hotels. Often overlooked, Jerusalem’s nightlife scene is actually vibrant and something that offers a totally different experience to Tel Aviv. 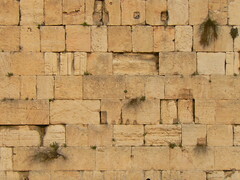 There is a fascinating array of museums in Jerusalem, some of which complete a visit to the city. Of these, perhaps the most important is Yad Vashem, situated on beautiful Mount Herzl, this is Israel’s memorial and place of commemoration for the millions who perished in the Holocaust. The incredible museum tells the story of the Holocaust not only in words, but also via its chilling architecture, and moving multimedia displays. 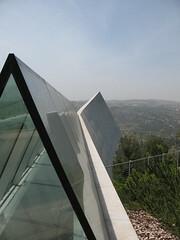 Yad Vashem isn’t fun, but it is somewhere everybody should visit. Just down the road, from Yad Vashem the newly renovated Israel Museum houses a huge selection of artistic, archaeological, historical and cultural displays including the world-famous Dead Sea Scrolls. And for kids in Jerusalem is the Jerusalem Biblical Zoo, technically Israel’s most popular visitor attraction with a great selection of animals (including a Biblical theme this being Jerusalem) as well as some more common-day favorites! Ultimately, Jerusalem is like nowhere else, a city where old and new jostle for space, along with the three religions who call this city holy. Incredibly intense, Jerusalem, the ‘City of Gold’ is somewhere beyond explanation, and no visit to Israel is complete without a visit here, no matter how long.